Often regarded as the ornamental flower garden, kitchen garden or vegetable patch nerve centre, the greenhouse can easily get cluttered, disorganised and generally become a mess without the provision of greenhouse staging – and that kind of chaos is bad news for gardeners but good news for pests, writes our horticuklturist Martin Fiddes. Greenhouse staging gives you the space – both storage and growing – to keep the greenhouse in a tidy and ordered state; and a clean, organised greenhouse is not the kind of place the vast majority of garden pests will want to hang out. But before you invest in a set of greenhouse staging, how do you know it’s going to do the job? Horror stories of greenhouse staging collapsing or leaning over precariously, Tower of Pisa-like, when stocked full of seedlings and equipment abound at allotments and kitchen gardens across the country. There are plenty of weak, poorly designed and manufactured low budget greenhouse staging units on the market but if you want to avoid a costly staging-based disaster then there’s only one place to shop! We’ve spent a great deal of time researching the greenhouse staging market, and about the same duration in thoroughly testing our design. Our greenhouse staging has been put through its paces at Stephanie’s Kitchen Garden and although our customers were more than satisfied with the build quality and strength of our staging units, there was one outstanding question we still hadn’t answered – what weight will it hold? Perhaps it’s not key to a successful unit – our customers would probably place strength, value for money, rigidity and ease of assembly above load-bearing on any staging attribute tick list – we thought we’d find out, and the result of our testing was amazing! We plucked one of our two-tier, 173cm (5’8”) greenhouse staging units off the shelf, put it together and started to load it up with bags of compost. Two bags per module (the 173cm long unit consists of three modules) became three, then the lower tier came into play until finally...we ran out of compost! But that’s not before we calculated that each module was supporting a heavyweight 77kg of compost, far in excess of any ‘normal’ greenhouse load. When you admire this impressive feat of staging strength, and throw in the other high specification details below, it’s not hard to understand that we’re justifiably proud of our greenhouse staging – and, as we said, if you want an incredibly strong yet lightweight, durable, anti-corrosive, reassuringly rigid, top quality staging unit for your greenhouse, then you’ve come to the right place! Want more info? 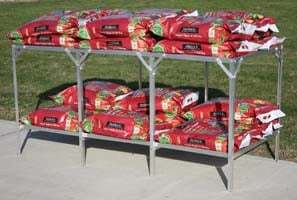 Visit our greenhouse staging product pages and feel the quality!